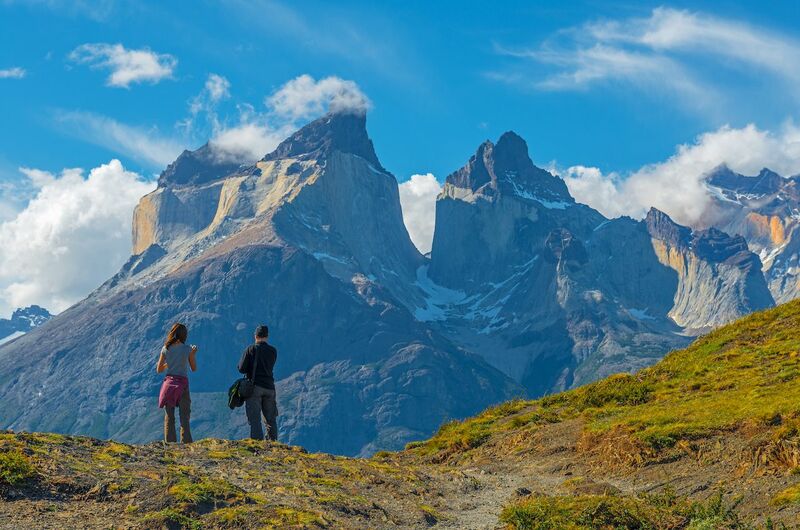 The W Trek of Torres del Paine National Park in Chilean Patagonia is one of the must-do multi-day hiking trails in the world. 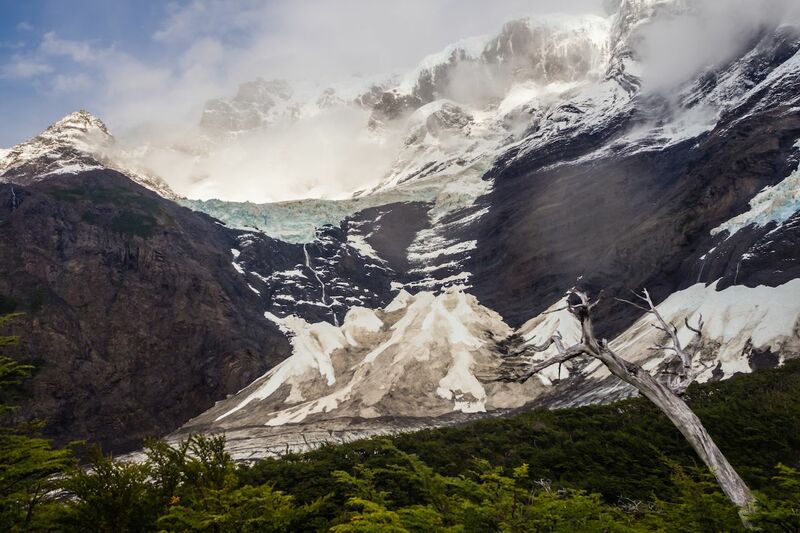 Winding in a “W” shape from one end of the Paine Massif mountains to the other, the trek takes hikers past some of the regions best sights: the Grey Glacier, the Torres, and the French Valley. At almost every step along the way, backpackers come face to face with some of the most stunning natural vistas anywhere in the world, from mountains blown and ground into incredible shapes to crystalline lakes dotted with icebergs to ethereal forests. 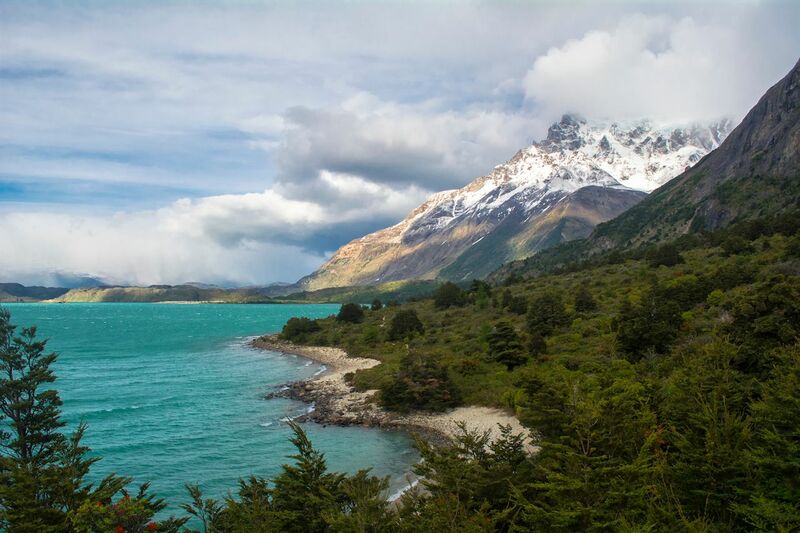 Although it’s hard to pick favorites on an amazing a trek like this, here are the most gorgeous sites along the W Trek in Torres del Paine. 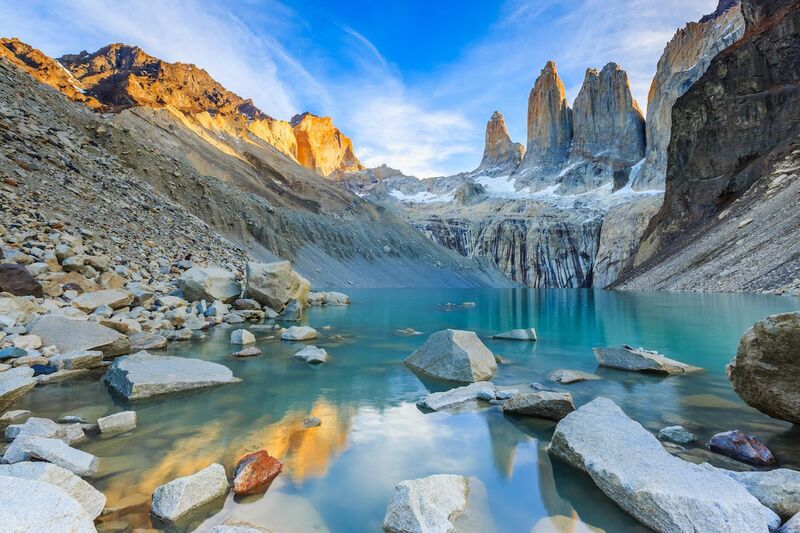 Apart from the sculpted granite horns of the Cuernos on the front of the Paine Massif, the base of the Torres is probably the most iconic site in Torres del Paine: three granite spires rising over an aquamarine lake cradled in a glacier-carved bowl. But getting to that astonishing view is not without effort. 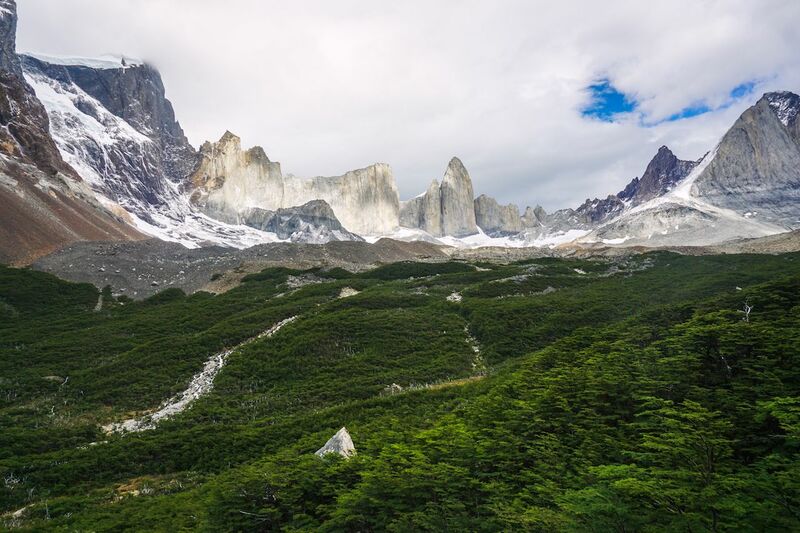 On average, it’s an eight-hour round trip hike up into the bowels of the Paine Massif, traversing rocky and uneven terrain and a craggy moraine before the summit. But at the end of it, you get to sit by the lake and admire the three eponymous towers of stone. While the views are unbeatable no matter the time of day, many hike in the morning from Refugio Chileno to see the sun rise over the Torres. To reach the Torres requires trekking up and into the heart of the massif, which is no small feat. 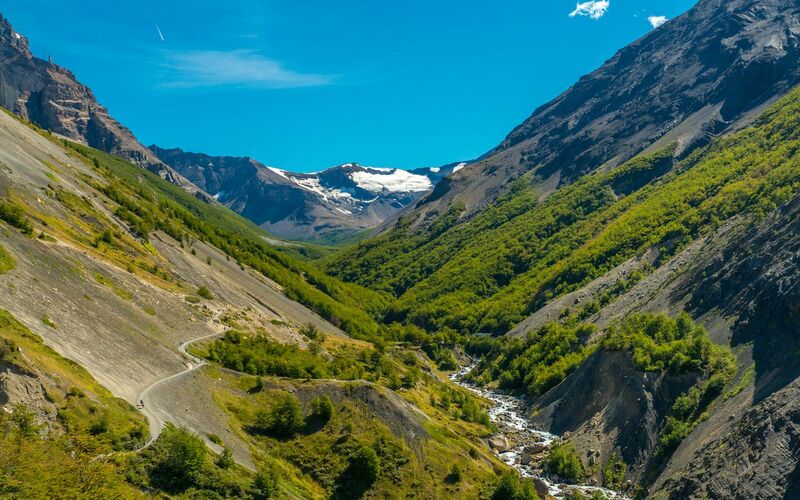 Starting from the Las Torres Hotel, you can follow a path that leads up the rocky base of Monte Almirante Nieto toward a V-shaped valley between it and Cerro Paine. Upon reaching the head of the valley, the path hugs the side of the canyon as it descends. On either side, mountains spliced by waterfalls tower overhead, with green forests filling the floor of the valley and the Ascencio river tumbling down from the far end of the basin. Once you get to the Refugio Chileno, you can also see the Torres peeking around the mountains further down the valley. One of the most stunning sights in the park are the lakes, which, thanks to minerals and sediment from the melting glaciers that feed them, have taken on unreal technicolor hues. One of the best examples is the bright turquoise of Lake Nordenskjold. Straddling the base of the massif, if you’re hiking from the east end of the W Trek toward Refugio Los Cuernos, you’ll catch your first glimpse of this shockingly blue lake. Fringed by Patagonian flatlands, with Monte Almirante Nieto and the Cuernos rising above on the right-hand side, it’s definitely a spot to stop and appreciate the view. The Grey Glacier is one of the three main highlights of the W. Hiking along the far western side of the massif, you’ll see the glacier getting closer as you head north toward Refugio Grey, but to get the best view you’ll need to go a bit further on past the Refugio. There are two suspension bridges once you get closer to the glacier where, if you’re doing the full Paine circuit that encircles the massif, you’ll be heading for John Gardner Pass. 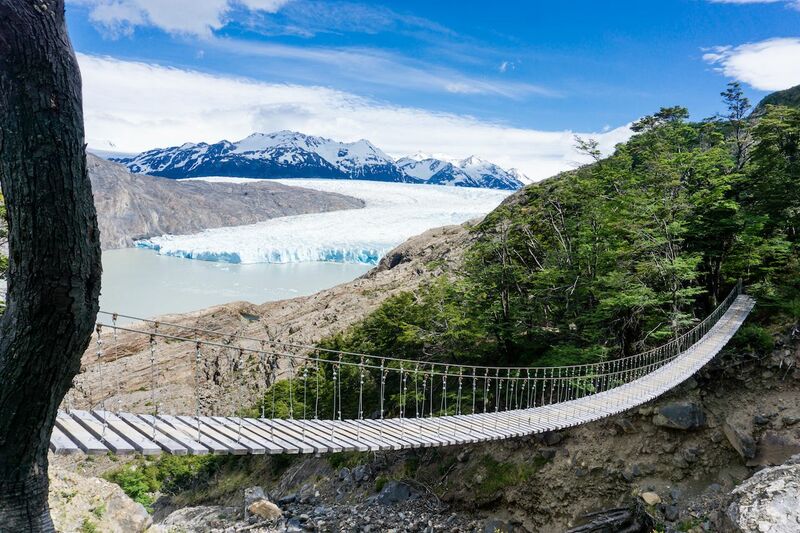 Both have amazing views of the glacier, Grey Lake, and surrounding landscapes, but the second suspension bridge is arguably the better of the two. It hangs over a rocky gorge, with green forests on either side. Off to the left, you can see Lake Grey, and it puts you practically parallel to the front wall of the Grey Glacier. If you don’t want to go all the way to the suspension bridges for a view, there’s a closer lookout only about a 10-15 minute walk from the Refugio Grey site. 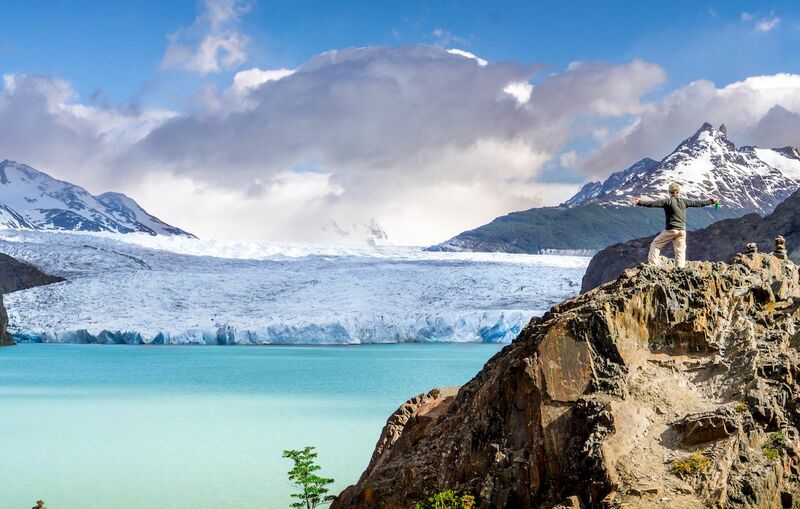 Here you’ll be able to take in the blue and white front wall of the glacier and see it stretching back into the Southern Patagonian Icefield. You’ll also see icebergs scattered in the teal waters of Grey Lake, and the tiny islands jutting up from the front of the wall. The wind coming off the glacier can be brutal, but the view is worth it. Right smack dab in the middle of the Paine Massif, the French Valley is somewhat unworldly. The bowl-shaped valley of streams and rivers, rocky terrain, and forests is surrounded by spectacularly shaped rock formations. From this viewpoint at the far end of the valley, you can take in the entire basin and the rim of mountains that encircles everything. As one of the harder to reach viewpoints on the trek, it’s usually a peaceful spot to sit and soak it all in. Refugio Paine Grande is one of the largest camping sites on the trek as it is an ideal starting or ending point thanks to its catamaran, which connects to Pudeto on the other side of Lake Pehoe. From the site, nestled against a large hill alongside Lake Pehoe, you can see the towering shape of the main Cuerno horn with its distinctive light grey body and dark grey caps. A perfect sight to take in after a long day of hiking. If you’re not able to hike all the way into the French Valley to the Britanico Lookout, the Frances Viewpoint at the entrance to the basin is still a spot worth reaching. Not only will you get your first glimpse into the valley and a distant view of Lake Nordenskjold, but you’re also directly opposite the Frances Glacier, a hanging glacier that frequently calves and causes small avalanches to cascade down the walls. The rumbling sound of the avalanches echoes throughout the region, and it’s a beautiful spot to appreciate the raw power of nature. 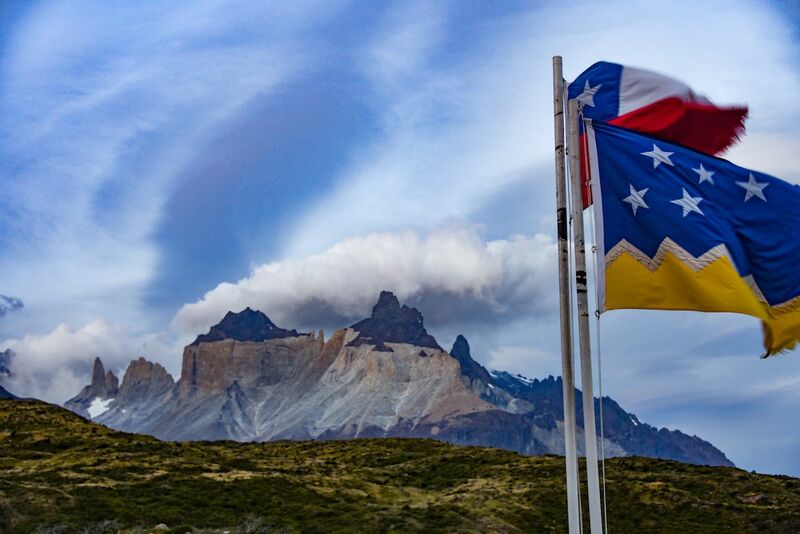 While not technically on the trek, this lookout offers a panoramic view of Paine Massif, particularly the Cuernos, and is definitely worth trying to squeeze into your W trek either at the beginning or end. During the trek itself, it’s hard to appreciate the sheer scale and majesty of the Cuernos since you’re trekking at their base, but this lookout on the opposite shore of Lake Nordenskjold has one of the best views of the Cuernos in the park. Also, if you’re ending at the Pudeto Catamaran launch, you can take a short walk to the lookout and see the Salto Grande waterfall. If you don’t have time to do this before hopping on the bus back, be sure to grab a window seat on the catamaran as the views during the crossing are also wondrous.